"The toughest part is overcoming some people thinking that this is a marketing kind of book. That may be for the estate, but to me it’s not at all. For me, it’s a labor of love. I wouldn’t have done it if I didn’t think I could continue what Bob did—create a very unique character." He did that by killing off a slew of supporting characters and reinventing Bourne to make the character his own. The New York Times reports that the franchising of authors is becoming very big business…and that the Ludlum estate is exploring every possible angle. In addition to the Bourne books, the Bourne movies, the COVERT-OPS books (which Ludlum began when he was alive with Gayle Lynds), and rewrites of unpublished Ludlum manuscripts, even more Ludlum books are in the works. The Ludlum estate is following the success of the Bourne books by reviving Peter Chanellor, the title character of THE CHANCELLOR MANUSCRIPT, which was published 30 years ago. The first 100 pages of the manuscript — by a veteran science-fiction writer — must still be approved by the estate. In addition, a script based on the original “Chancellor” is being developed for Leonardo DiCaprio. The estate is also looking at TV series deal surrounding the shadowy Treadstone agency in the Bourne books, but would exclude Bourne if it is produced. A Bourne video game from Vivendi is due out next year. I guess this means we’ll soon be seeing sequels to THE OSTERMAN WEEKEND (The Osterman Weekday, etc. ), THE SCARLATTI INHERITANCE (The Scarlatti Probate, etc.) and every other book Ludlum ever wrote. (Does this mean even the novels he wrote under a pseudonym will soon be franchised, too?). This isn’t new, of course. Hundreds of Sherlock Holmes books have been written, and there were new SAINT novels being written while Leslie Charteris was still alive. But somehow it seems to be much more blatant, crass, and widespread today than it ever was before. I am seeing more and more books "Created" by certain bestselling authors rather than new novels written by them. But I am certainly not one to criticize the practice of writing or reading these books. Writing a book under the umbrella of a living or dead author isn’t so different than what I am doing by writing TV tie-ins. The only difference is that I have an actor’s picture on the cover rather than a famous author’s name…but I have had the opportunity. Many years ago, I had a chance to write an EXECUTIONER novel, and passed. I was eager to make a name for myself as a writer and didn’t think it would happen if Don Pendelton’s name was on the cover of the books I wrote and not my own. More recently, I was offered the opportunity to "co-write" a novel with a famous actor with a highly marketable persona (his name would be in big letters across the top, of course) and, after a lot of thought, I decided to pass. It’s not that the idea wasn’t good (it was), or that they wouldn’t sell (they probably will do quite well), or that working with the actor wouldn’t have been fun (it probably would have been), but I decided that I’m already doing books based on a pre-existing media property (Monk)…and that’s enough. If I have time to write any other books, I want them to be my own. But I can certainly understand why an established novelist like James Webb would jump at doing a Ludlum novel…or why John Gardner, Kingsley Amis and now Sebastian Faulks would tackle James Bond novels. There’s the money, of course, and the pleasure of writing about a character that they love (or continuing the legacy of an author they admire), but it’s also an irresistable opportunity to reach a far larger audience than they are already reaching with your own novels. It was certainly one of the motivations for accepting the DIAGNOSIS MURDER deal…and later the MONK contract. I also get the appeal to readers of new books continuing the characters created by a dead author…and written in the same style….but I have a harder time understanding the appeal to readers of the branded books by "living" authors. I love Larry McMurtry’s westerns and most of John Irving’s novels…but I doubt I’d rush to the bookstore to buy a novel "Created by Larry McMurtry and Biff Pevnick, written by Ian Ludlow" or "John Irving’s THE UNIVERSE ACCORDING TO GARP by Ian Ludlow." Would you? Roger Moore narrates a fun and fascinating BBC radio documentary on Leslie Charteris, author of the Saint. Among those interviewed is my Uncle Burl Barer, the Edgar-award winning author of a book on Charteris and the Saint (who must have crapped himself when he heard Moore, his childhood idol, introducing him). Moments after I finished proofing the galleys for MR. MONK IN OUTER SPACE on Friday I received this photo of the dustjacket. I like it! The book comes out on Oct. 30th. 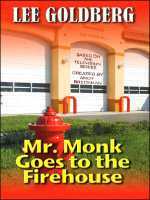 I’ve also just seen the covers for the Large Print editions of MR. MONK GOES TO THE FIREHOUSE and MR. MONK GOES TO HAWAII…and I like them a lot. (You can click on the photos for larger images). The screening of my FAST TRACK cut for the network execs last week at the Action Concept studios in Cologne went very well. They loved it…much to my relief. I’ve made their suggested changes to the cut and now I’m waiting to attend the "big" screening of the pilot at the network headquarters in Munich on August 8th. In the mean time, I am continuing with post-production…which includes working with the composer, the fx team, and supervising the "clean" cut for U.S. broadcast TV. But I’ve snuck away for fives days with my family for a little European road-trip before they head back to L.A. on the 3rd (I’m still working though…I have a MONK book to write). We visited Brugge, Belgium, which is one of the most beautiful places I have ever seen. I must have taken 500 photos of the place. I’ve posted a couple of them here. Today we visited Antwerp and tomorrow it’s off to Amsterdam for a day or two…then back to Cologne. Sorry I have been scarce around here lately — I’ve just been too busy to post. I’m back in Cologne after five days in the tiny village of Lohr, where I taught my fourth "Writers Room" seminar in Germany and researched my next MONK novel. I think it went well — I certainly had a good time. While I was in Lohr, I screened the rough cut of FAST TRACK for the students (all writer/producers in Germany) and got some valuable feedback. I stayed in touch with the post-production department and, thanks to the wonders of high-speed internet, was able to fine-tune a "teaser trailer" for our international sales department, watch a few fx shots, and review the "audition scenes" submitted by four different composers who would like to do our score. On Sunday night, I found three hours for a walking tour of Lohr with a very knowledgeable woman from the historical society. 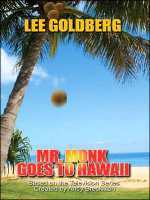 As if all that wasn’t enough to deprive me of sleep, the galleys for MR. MONK IN OUTER SPACE arrived while I was there and I have begun proofing the manuscript, which has to be back in NY at the end of the week in order to make the Oct. 30 pub date. Early tomorrow morning, I’m making a few last minute tweaks to the FAST TRACK cut before the network execs arrive from Munich to see it. I’m crossing my fingers that they will like it! Okay, time to go back to the galleys. I’ll report back soon. I’ve finished my producer’s cut of FAST TRACK: NO LIMITS. The studio loved it so now we’re just making some tiny, technical tweaks before I screen the cut for the network on Wednesday. Then I get their notes, do my final cut…and await the word on whether we go to series or not. I really enjoy the editing process…the frustration, the exhiliration, and the discovery that comes with it. It all starts with the show you imagine…and then it becomes the show you’ve written, which is always a bit different because it evolves as you are writing it. Then there’s the show that’s shot…which is never quite what you imagined, since you are taking a dream and asking hundreds of people to help you make it real. Their creative work, along with the reality of taking what’s on the page and making it live, shapes the show into something new. And, finally, there is the show you create in the editing room. You can’t expect to see the show that you first imagined. As you cut, rearrange, choose angles, drop dialogue, add dialogue, etc., you discover the show amidst the footage. Yes, the show I created is still there…but it has become something else…and, luckily for me, something much better.